Steve Jobs Uses a Jailbroken iPhone 3.1.2? You’d think that Steve Jobs would be running the latest unreleased version of iPhone OS on his iPhone but according to an email received by a 9to5Mac user from Steve Jobs, he seems to be running iPhone OS 3.1.2. 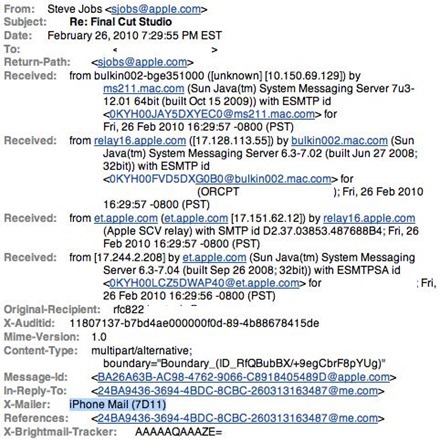 His iPhone is listed as iPhone Mail 7D11 in the email header which means that he is running iPhone 3.1.2 instead of iPhone 3.1.3, let alone running the latest unreleased firmware. Now why would Jobs use 3.1.2 instead of 3.1.3? Maybe he is just too busy to update, or maybe he doesn’t connect to iTunes that often?. Or maybe he doesn’t want to lose multitasking (Backgrounder + ProSwitcher) capabilities on his jailbroken iPhone ;). You can follow me on twitter or join our facebook fanpage to keep yourself updated on all the latest iPhone releases. wellllll; won’t be a sin if he’s using and jailbreacked phone… ¿?¿?¿?